Upload videos, photos, blog entries and status updates to all of your favorite sites, as well as your friends directly by email, with just one click. 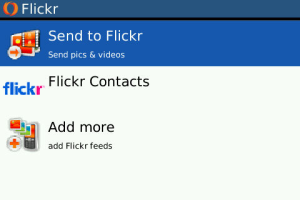 Connect with over 50 social networking sites including Facebook, Twitter, YouTube, Flickr, Picasa, Photobucket , TwitPic, Snapfish, and more. Are you a blogger? ShoZu supports all of the popular blogging platforms including WordPress, Blogger and TypePad. ShoZu also keeps you up to date on whats going on with your friends. Download feeds to see your friends tweets, status updates and photo updates! To try before you buy why not download our FREE app, ShoZu Lite? With ShoZu Lite you can upload up to 5 photos or videos to your favorite destinations as well as downloading feeds and updating your status. Once you have reached the upload limit you will need to upgrade to the full version of ShoZu to continue sharing your photos and videos but youll still be able to update your status, tweet and download your favorite feeds.